Plus taxes* For 12 Months w/12 mo agmt, $5/mo. discount (autopay may be req’d). Up to $7.99/mo Broadcast & add’l fees apply. *NEW RESIDENTIAL CUSTOMERS ONLY. $35 ACTIVATION, EARLY TERMINATION FEE ($15/MO) FOR EACH MONTH REMAINING ON AGMT, EQUIPMENT NON-RETURN & ADD’L FEES APPLY. Price is after $5/mo. autopay discount for 12 mos. Pay $40/mo. + taxes until discount starts. Discount is instant for online orders on att.com only. In other channels AutoPay is req’d and discount starts w/in 3 bills. Incl. U-family All Included HD service, equip fees for 1 HD DVR and standard pro installation. Restr’s apply. AT&T also offers 4 different U-verse TV packages designed with your needs in mind. Even if you’re moving or constantly on the go, the U-verse mobile app lets you stream live TV, watch On Demand content*, and use your mobile device as a remote. * Max 2 per household; req's power and connection to TV; range of wireless signal limited. ^ Req's HD Premium Tier ($7/mo.) and U450. † With SELECT through ULTIMATE Pkgs. After 3 mos., services automatically continue each mo. at then prevailing rate (currently $53.99/mo.) unless you call to change or cancel. Req’s you to select offer. Plus taxes* For 12 months w/12 mo agmt, after $5/mo. discount (autopay may be req'd). Pay $40/mo plus taxes until discount starts w/in 3 bills. Up to $7.99/mo Broadcast & add'l fees apply. Plus taxes* For 12 months w/12 mo agmt, after $5/mo. discount (autopay may be req'd). Pay $60/mo plus taxes until discount starts w/in 3 bills. Up to $7.99/mo Broadcast & add'l fees apply. Plus taxes* For 12 months w/12 mo agmt, after $5/mo. discount (autopay may be req'd). Pay $65/mo plus taxes until discount starts w/in 3 bills. Up to $7.99/mo Broadcast & add'l fees apply. Plus taxes* For 12 months w/12 mo agmt, after $5/mo. discount (autopay may be req'd). Pay $115/mo plus taxes until discount starts w/in 3 bills. Up to $7.99/mo Broadcast & add'l fees apply. Get a $100 AT&T Visa® Reward Card* when you sign up for U-verse TV! $100 REWARD CARD FOR TV: Offer subj. to change and may be discontinued at any time. Requires purchase of qualifying TV package (min. $35/mo. for 12 mos. after Autopay/paperless bill discount that starts w/i 3 bills. Prices higher in 2nd year) through All Home Connections and card fulfillment. Qualifying Packages: U-Family or above. For new residential customers Residents of select multi-dwelling units are not eligible for this offer. Reward Card: Will be sent email or letter with redemption requirements. Redemption req’d. w/in 75 days from reward notification mail or email date. Reward Card delivered within 3-4 weeks after redemption to customers who maintain qualifying service from installation date and through reward fulfillment. Card expires at month-end 6 months after issuance. No cash access. For cardholder agreement, go to rewardcenter.att.com. AT&T Reward Card issued by U.S. Bank National Association, pursuant to license from Visa U.S.A. Inc. Ends 6/30/19. It finally happened: several of your favorite shows are airing live—at the same time. Fortunately, with the U-verse Total Home DVR, you don’t have to worry. Record up to four of your favorite shows simultaneously, and store up to 460 hours of SD or 165 hours of HD content*. *New TV customers ordering U300 or U450 will get larger capacity DVR. With other plans or existing customer upgrades, larger capacity DVRs subj to availability and add'l fees. If you’re moving or living life on the go, the U-verse App has you covered. Stream live TV and watch premium channels and On Demand content, all on your mobile device*. *Requires qualifying device and data connection. Access to content varies by device, TV plan, and viewing location. Data charges may apply. Are you a sports fan? With the SEC Network on U-verse, never miss a game again with access to exclusive live events, games from all 14 SEC schools, and 24/7 football, basketball, and baseball coverage (and more!). My Multiview is a U-verse TV app that makes it easier than ever to keep track of your favorite programs and record them. You can watch up to 4 shows on the same television at once, switch from a large view window to a different show with one button, and search all available picture-in-picture screens. My Multiview also allows you to create and curate your own favorite channels lists, so you can watch what you want when you want. Channels/content in Multiview based on TV plan. With a U-verse Wireless TV Receiver you can get TV service anywhere in your home without being tethered to a TV outlet. You can place a TV in your garage, kitchen or anywhere with electricity on your property, and still get a crystal-clear picture. The receiver can also stream high definition content with qualifying TV packages. *Max 2 per household; req’s power and connection to TV; range of wireless signal limited. Save yourself money and time when you bundle U-verse TV with AT&T Internet and AT&T digital home phone. †Claim based on U-verse High Speed Internet service. Discover all of the channels available on U-verse TV. *HD: Access to HD service requires $10/mo. Over 225 HD channels available with upgrade to U450 and HD Premium Tier. Make watching TV safe and fun for the whole family with Parental Controls, included with your U-verse TV service. Block programs and channels you deem inappropriate, and even hide or remove them altogether from the channel guide. You can also set up a PIN to lock the TV, prevent unsupervised viewing, limit viewing times, and establish spendings limits for Pay-Per-View events or movies. Get a customized TV package for the whole family with sports, news, and entertainment channels for everyone, or get U-family—tailored specifically for families and children. U-family has over 200 digital channels, including Animal Planet®, Disney Channel®, Nickelodeon®, and Sprout®. You’ll also get access to an On Demand Library, local channels, and one HD-ready DVR receiver with Total Home DVR Service. Sports fans everywhere love U-verse TV. Keep up on your favorite sports with NBA LEAGUE PASS, ESPN GamePlan, ESPN FULL COURT, MLB Extra Innings, and Fox Soccer PLUS HD—including English Premier League soccer and the National Rugby League. U-verse also provides local and national news channels. Because U-verse services are delivered over a network that includes fiber optic technology,* you can rest assured knowing that the quality of your signal won’t be compromised. AT&T U-verse is more than reliable—it’s a service you can depend on. AT&T U-verse has the features you need and love. Record four shows at once on a single Total Home DVR, watch TV virtually anywhere in your home with the U-verse Wireless Receiver*, and stream Live TV on your phone with the U-verse App^. ^Requires qualifying device and data connection. Access to content varies by device, TV, plan, and viewing location. Data charges may apply. AT&T customer service is always there to help you with your orders, billing, tech support, and more. All you have to do is call AT&T’s phone number—1-800-288-2020—and they will be happy to assist you. How many channels does U-verse TV have? U-verse offers up to 550 channels, but availability will depend on your subscription. See all available TV packages here. What do I need for U-verse TV installation? Your installation needs will depend on whether you’re using professional installation or opting for self-installation. 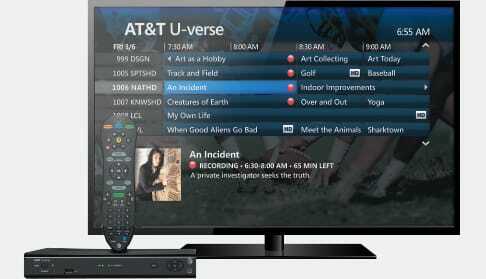 U-verse is AT&T’s state-of-the-art television service. Shop U-verse TV here. Does AT&T U-verse TV use a satellite? No. U-verse is Internet Protocol Television (IPTV) and does not require a satellite. How do I reset my U-verse receiver? Press and hold the power button for ten seconds. Find more info on troubleshooting your receiver here. How do I view messages waiting on my TV? Press MENU on your U-verse Remote, find the Message Center, and press OK. Select a message, then press OK to view the details. 1-YR U-FAMILY ALL INCLUDED TV PACKAGE: Ends 6/30/19. $35 for first 12 mos. only. After 12 mos, then prevailing rate applies (currently $84/mo), unless cancelled or changed prior to end of promo period. Pricing subject to change. $5/mo. discount: Must enroll in autopay & paperless bill w/in 30 days of TV activation to receive bill credit starting in 1-3 bill cycles. First time credit will include all credits earned since meeting offer requirements. Must maintain autopay/paperless bill and valid email address to continue credits. No credits in 2nd year for autopay & paperless bill. Incl. U-family HD service, equip fees for 1 HD DVR and standard pro installation. Exclusions: Price excludes applicable use tax expense surcharge on retail value of installation, custom installation, equip upgrades/add-ons (each add'l receiver $10/mo) & other charges, including Broadcast Fee (up to $7.99/mo), a federal regulatory video cost recovery chrg and city video cost recovery fees. Credit restr’s apply. Pricing, programming, features subj to change at any time without notice. Subject to AT&T U-verse TV Terms of Service (at att.com/legal). 1-YR U200 ALL INCLUDED TV PACKAGE: Ends 6/30/19. $55 for first 12 mos. only. After 12 mos, then prevailing rate applies (currently $107/mo), unless cancelled or changed prior to end of promo period. Pricing subject to change. $5/mo. discount: Must enroll in autopay & paperless bill w/in 30 days of TV activation to receive bill credit starting in 1-3 bill cycles. First time credit will include all credits earned since meeting offer requirements. Must maintain autopay/paperless bill and valid email address to continue credits. No credits in 2nd year for autopay & paperless bill. Exclusions: Price excludes applicable use tax expense surcharge on retail value of installation, custom installation, equip upgrades/add-ons (each add’l receiver $10/mo) & other charges, including Broadcast Fee (up to $7.99/mo), a federal regulatory video cost recovery chrg and city video cost recovery fees. Credit restr’s apply. Different offers may apply for eligible multi-dwelling unit customers. Pricing, programming, features subj to change at any time without notice. Subject to AT&T U-verse TV Terms of Service (at att.com/legal). 1-YR U300 ALL INCLUDED TV PACKAGE: Ends 6/30/19. $60 for first 12 mos. only. After 12 mos, then prevailing rate applies (currently $124/mo), unless cancelled or changed prior to end of promo period. Pricing subject to change. $5/mo. discount: Must enroll in autopay & paperless bill w/in 30 days of TV activation to receive bill credit starting in 1-3 bill cycles. First time credit will include all credits earned since meeting offer requirements. Must maintain autopay/paperless bill and valid email address to continue credits. No credits in 2nd year for autopay & paperless bill. Exclusions: Price excludes applicable use tax expense surcharge on retail value of installation, custom installation, equip upgrades/add-ons (each add’l receiver $10/mo) & other charges, including Broadcast Fee (up to $7.99/mo), a federal regulatory video cost recovery chrg and city video cost recovery fees. Credit restr’s apply. Different offers may apply for eligible multi-dwelling unit customers. Pricing, programming, features subj to change at any time without notice. Subject to AT&T U-verse TV Terms of Service (at att.com/legal). 1-YR U450 ALL INCLUDED TV PACKAGE: Ends 6/30/19. $110 for first 12 mos. only. After 12 mos, then prevailing rate applies (currently $154/mo), unless cancelled or changed prior to end of promo period. Pricing subject to change. $5/mo. discount: Must enroll in autopay & paperless bill w/in 30 days of TV activation to receive bill credit starting in 1-3 bill cycles. First time credit will include all credits earned since meeting offer requirements. Must maintain autopay/paperless bill and valid email address to continue credits. No credits in 2nd year for autopay & paperless bill. Exclusions: Price excludes applicable use tax expense surcharge on retail value of installation, custom installation, equip upgrades/add-ons (each add’l receiver $10/mo) & other charges, including Broadcast Fee (up to $7.99/mo), a federal regulatory video cost recovery chrg and city video cost recovery fees. Credit restr’s apply. Different offers may apply for eligible multi-dwelling unit customers. Pricing, programming, features subj to change at any time without notice. Subject to AT&T U-verse TV Terms of Service (at att.com/legal). $75 1-YR BUNDLE PRICE: End 6/30/19. Pricing: All Included TV pkg pricing includes monthly fees for HD service, one HD DVR and standard prof’l installation. $5/mo Discount: Must enroll in autopay & paperless bill within 30 days of TV activation to receive bill credit starting in 1-3 bill cycles. First time credit will include all credits earned since meeting offer requirements. Must maintain autopay/paperless bill and valid email address to continue credits. No credits in 2nd year for autopay. Pricing: $75/mo for first 12 mos only. Includes U-family All Included pkg ($35/mo), Internet ($40/mo) for Internet speed tiers (10M to 100M) & Wi-Fi Gateway. After 12 mos. or loss of eligibility, then prevailing rate applies (currently $124/mo. ), unless cancelled or changed prior to end of the promo period. Exclusions: Price excludes applicable use tax expense surcharge on retail value of installation, custom installation, equip upgrades/add-ons (each add’l receiver $10/mo) & other charges, including Broadcast Fee (up to $7.99/mo), a federal regulatory video cost recovery chrg and city video cost recovery fees. Credit restrictions apply. Different offers may apply for eligible multi-dwelling unit customers. $100 1-YR BUNDLE PRICE: End 6/30/19. Pricing: All Included TV pkg pricing includes monthly fees for HD service, one HD DVR and standard prof’l installation. $5/mo Discount: Must enroll in autopay & paperless bill within 30 days of TV activation to receive bill credit starting in 1-3 bill cycles. First time credit will include all credits earned since meeting offer requirements. Must maintain autopay/paperless bill and valid email address to continue credits. No credits in 2nd year for autopay. Pricing: $100/mo for first 12 mos only. Includes U300 All Included pkg ($60/mo), Internet speed tiers (10M to 100M) ($40/mo) & Wi-Fi Gateway. After 12 mos. or loss of eligibility, then prevailing rate applies (currently $164/mo. ), unless cancelled or changed prior to end of the promo period. Exclusions: Price excludes applicable use tax expense surcharge on retail value of installation, custom installation, equip upgrades/add-ons (each add’l receiver $10/mo) & other charges, including Broadcast Fee (up to $7.99/mo), a federal regulatory video cost recovery chrg and city video cost recovery fees. Credit restrictions apply. Different offers may apply for eligible multi-dwelling unit customers. VIDEO LOYALTY CREDIT: Limited Time Oﬀer. Must have both eligible services ordered on or before the promo ends to get $15/mo. credit. Eligible Services: Requires AT&T Unlimited &More or AT&T Unlimited &More - Premium wireless plan. With Premium: get $15/mo. off qualifying packages of residential DIRECTV (excludes prepaid), U-verse (geo/svc restr’s apply) or DIRECTV NOW (excludes Puerto Rico and U.S. Virgin Islands). With &More: get $15/mo. off DIRECTV NOW (excludes Puerto Rico and U.S. Virgin Islands). Credit: Will not exceed the cost of your base package (excludes add-ons). Credits start w/in 3 bill cycles after activating/installing both services. A one-time catch-up credit is applied for the time since customer met offer requirements to time loyalty credit begins, which does not change taxes. For DIRECTV NOW, go to directvnow.com and verify your wireless account to redeem the offer. Credits may start after existing promotions expire & for DIRECTV NOW may be refunded to method of payment. Credits cease if cancel eligible service. Exclusions: Select promotional, trial & other video packages are not elig. for oﬀer. Limits: 1 credit per wireless account. May not be stackable w/other oﬀers, credits or discounts. For Premium customers with two or more qualifying video services, AT&T may select the account the credits apply towards. Credit may not be applied towards DIRECTV NOW. Credit not available to AT&T employees and retirees. AT&T employees and retirees are not eligible for the Video Loyalty Credit offer. AT&T employees, retirees & IMO consumers are not eligible for the autopay & paperless bill discount, adding WatchTV at no extra charge or the &More Premium add-on. AT&T U-VERSE SVC TERMS: Subject to Customer Agreement (at att.com/legal). If new customer, 12 month agmt. req’d (excl. U-Basic). Must maintain a min. base TV pkg of $19/mo. Additional Fees: Pricing excludes taxes & equipment fees.EARLY TERMINATION FEE OF $15/MO. FOR EACH MO. REMAINING ON TV AGMT (EXCL. U_BASIC), ACTIVATION UP TO $35, EQUIPMENT NON-RETURN, INSTALLATION FEE ($199 FOR U-BASIC), & ADD’L FEES APPLY (including BROADCAST TV SURCHARGE UP TO $7.99/MO, FEDERAL REGULATORY VIDEO COST RECOVERY CHRG & CITY VIDEO COST RECOVERY FEES). Restrictions: Credit, geographic and service restrictions apply to AT&T U-verse services. Call or go toatt.com/uverse to see if you qualify.